Following are some tips (they are not recommendations!) for encouraging sharks to overcome their natural shyness of humans. Keep in mind that any action that you take in order to get closer to these animals also puts you further into harms way. A shark can lunge much faster than you can parry so when you get within arms length of a hungry reef shark you are effectively defenseless if it decides to attack. There are rare occasions when for no apparent reason a shark will persistently make close passes to the delight of underwater photographers. More commonly however, getting near enough to a shark to get a crisp shot with some nice skin tones in it is an exercise in frustration unless you have some kind of attractant. Chum is the obvious stimulus to encourage the sharks into the general area but sometimes even when there is bait in the water, the sharks refuse to approach the photographers, preferring to skulk at the edge of visibility until the divers leave. You can't blame the sharks for this, they are naturally cautious creatures and you don't reach the top of the food chain by taking unnecessary risks. If you're patient and calm the sharks will sense it and feeling less threatened they will most likely come closer. If you're nervous and jumpy you probably shouldn't be trying to get closer in the first place. Picture this; you're positioned unobtrusively behind a coral head. 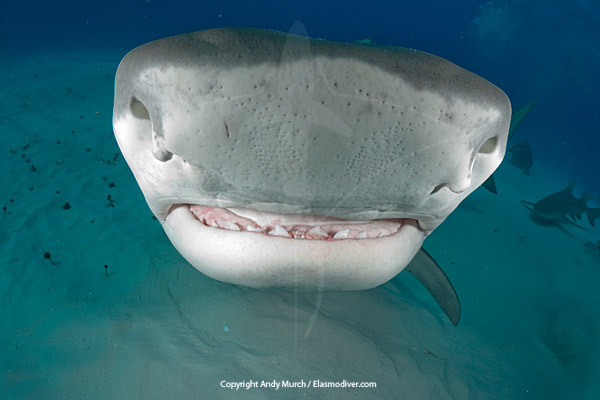 A large Tiger Shark is nonchalantly ambling towards you looking like a striped reef god. Its muscles ripple as it slips between some fan corals in its path. It is almost within range of your strobes. Your lungs begin to burn and unable to hold your breath any longer, you exhale a short burst of bubbles and watch in anguished silence as the shark turns on a dime and bolts for the liquid horizon. Perhaps its the unexpected movement or maybe its the intensity of the noise but for some reason sharks hate bubbles. Whether you're diving with Whale Sharks or Wobbegongs, breathing hinders successful photography. New divers are told to breathe continuously while under water. This is good advice but sooner or later most divers get to the stage where they are comfortable holding their breath for short periods in order to avoid spooking marine life. Photographers become masters at timing their breathing but there are ways to avoid this issue completely. The low tech answer is to learn to free dive. There is more to free diving than simply seeing how deep you can fall without your lungs imploding. I have seen some incredible shark footage that I would not have thought possible until I found out that it was captured by free divers. The key is to weight yourself correctly and stay calm. Being able to slip under the waves for two or three minutes at a time in the company of sharks can result in some great encounters but there are drawbacks and dangers. If like me you are not an expert, you will spend most of your time snorkeling at the surface which attracts the kind of shark attention that you don't need. Also, free divers are prone to shallow water oxygen blackouts caused by oxygen starvation and the build up of C02. Never free dive alone and consider taking some lessons from a qualified free diver. The high tech answer is to dive using a rebreather unit that recycles each breath scrubbing away the C02 and injecting new oxygen as required. On a recent trip to North Carolina I took along my Buddy Inspiration Rebreather and I was glad that I did. While the other divers were on the wreck the Sandtiger Sharks refused to come close but as soon as the bubble blowers left I was inspected by numerous curious sharks resulting in some great images. 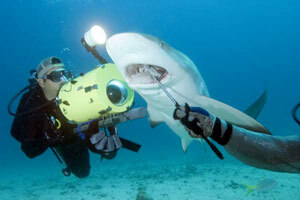 Rebreathers are expensive toys but if you are serious about your shark photography you wont be disappointed. Shark Diving 101 looks at the safety precautions that you can take when entering the water with sharks. 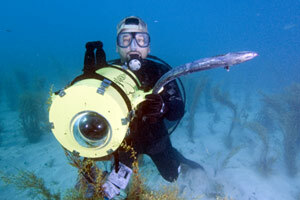 One of the key elements to avoiding exploratory bites is to wear dive gear that is neither bright nor reflective. By toning down your diving wardrobe, you will theoretically be left alone by the sharks and ultimately have a more enjoyable and rewarding experience (jeez, I sound like a PADI Instructor). That's all well and good for spectators at a feed but from a photography stand point distance is usually the enemy. I know of one videographer who has pushed this concept way beyond the bounds of sanity. He attaches old compact discs to his chest and shoulders to recreate the flickering patterns emitted by a school of fish. The fact that he does not move as fluidly as a school of healthy fish, adds to the attention this elicits. Using jerky body movements is a double edged sword. If the sharks are getting worked up it will probably peek their interest but if they are already acting timidly it will more likely scare them away. If carrying the bait around with you doesn't seem like the smartest thing to do, don't do it! There is no denying that you will become the centre of attention but at what cost? Sooner or later a shark is going to pluck up the courage to make a dash at the bait and when it does, it might not simply be a matter of dropping the fish and swimming away. Other sharks may also get involved and if they get worked up enough you could easily get caught in the middle of a feeding frenzy. I have put fish in my BC pockets, waved a carcass around, and spent the whole dive sitting on a bait crate without getting bitten but that doesn't mean that it is a wise activity. The sharks may only be after the food but when their eyes are shut and they are being jostled by other sharks they will have a hard time telling where the fish stops and your arm starts. If you are attending a well organized shark feed where there is a feeder or dive master who hand feeds the sharks, it may be possible to arrange to have him or her lead the sharks past you in such a way that you can get some very close feeding shots. Sometimes this is standard protocol when photographers are present and sometimes it requires a little persuading to convince the feeder that you are comfortable enough around sharks to act responsibly. Remember that if the DM says no you should respect their decision. Usually there is a good reason e.g. it may be much harder to control the feed when divers are in positions that the resident sharks are not used to. If you can arrange for this to happen, don't waste the opportunity. Get as low as possible (usually divers are overweighted on shark feeds to keep them in position) and shoot a variety of compositions, some with the feeder in the shot and some with just the sharks. Generally the wider and closer you can shoot the more dramatic the shots will look. Bottling is a technique that some divers tell me they use to great effect to entice sharks to come and check them out. Personally, I have never been able to get it to work so maybe I'm doing it wrong but here is the technique as I understand it. Take a bottle along on the dive hidden inside your bc. The best type would be a small ribbed plastic bottle e.g. a disposable 750ml water bottle. Discreetly take out the bottle and roll it between your palms with enough force to make it crackle. The resulting noise is supposed to mimic the sound of fish bones as they are being crunched between a sharks teeth. Before the sharks (theoretically) arrive from all directions to investigate, hide the bottle again so that they don't catch on. You may need to get the pitch right by letting some water into the bottle. I like this system for a few reasons. Firstly, it doesn't involve killing and fish for bait. Secondly, you're not actually feeding the sharks so there is no reason to think you are changing their behavior. And thirdly, you can carry a bottle with you just about anywhere. Its a shame I can't get it to work. Photographing sharks is fundamentally the same as photographing anything else underwater. 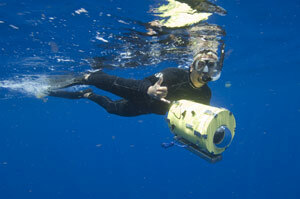 A submersible camera and a means of breathing are all that you really need. Having said that, there are a number of things you can do before you go shark diving to improve your chances of getting the shot but remember the warning about getting too close to the action! Wear brighter gear - but remember why they call it yum yum yellow.